The Port of Savannah has shattered its record for container traffic in a year, processing more than 4 million industry-standard 20-foot-equivalent units (TEUs) in 2017, the Georgia Ports Authority announced Jan. 22. The previous record was 3.7 million TEUs in 2015. The annual total for last year marked an 11% increase over the 3.64 million TEUs in 2016. 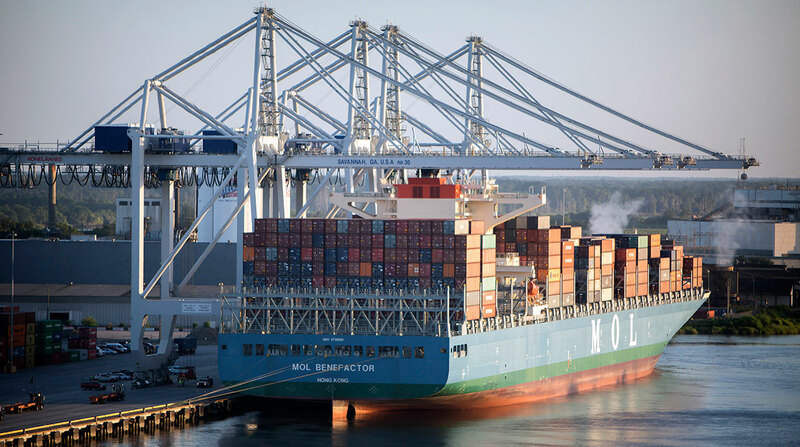 “Savannah is double the size of the next largest port in the region, highlighting Georgia’s growing role as a gateway for American cargo,” Georgia Ports Authority Executive Director Griff Lynch said. In the Southeast, the Port of Savannah’s total is higher than the Port of Virginia’s 2.84 million and the Port of Charleston’s 2.18 million TEUs for the full year. “These numbers clearly show that Georgia has the fastest growing and most critical port in the Southeast,” Lynch said. The Port of New York and New Jersey will remain the busiest containerport on the East Coast, on pace to move more than 6 million TEUs when the final numbers are released later this month. For December, GPA handled 323,117 TEUs, up 10.6% from the same month the year before. Loaded imports grew 11% to 148,121 TEUs, while exports jumped 14% to 118,300. Intermodal rail moves from the Garden City Terminal rose 19% year-over-year in December, reaching 65,000 TEUs. GPA is scheduled to break ground on the Mason Mega Rail terminal in early spring, which would double the rail lift capacity to 1 million containers per year when completed in late 2020. Meanwhile, Gov. Nathan Deal allocated $35 million to the Savannah Harbor Expansion project when he released his budget proposal on Jan. 11, bringing the state share to $301 million. In early December, three dredges began work in the Savannah River to increase the channel depth to 47 feet from 42 feet. Work to deepen the 18.5-mile outer harbor to 49 feet should be completed this year. The project is expected to be finished in late 2021 or early 2022. The board of directors also approved a $3.5 million request to update the electrical drives on four older ship-to-shore cranes to increase speed and efficiency.